Under the direction of its Chief Conductor Alexander Liebreich, the National Symphony Orchestra of Polish Radio (NOSPR) is the leading ensemble in the country and is one of Europe’s major radio orchestras. 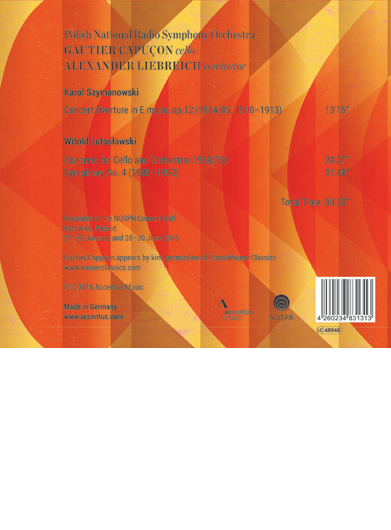 As cultural ambassadors with a rich tradition, the orchestra has made its mark through performances of Polish composers, as it is impressively seen on this CD that features works by Karol Szymanowski and Witold Lutoslawski. It is the final recording of a three-part cycle of works by these influential Polish composers. The first two CDs were unanimously praised by international reviews. Next to the ecstatic Concert Overture in E major, Op. 12, an early work by Szymanowski, the NOSPR performs Lutosławski’s contemplative and yet excessive 4th Symphony, a work that the composer finished shortly before his death in 1994. Gautier Capuçon, one of the leading cellists of his generation, is the impressive soloist in the Concerto for Cello and Orchestra, probably the most famous work of Lutosławski.